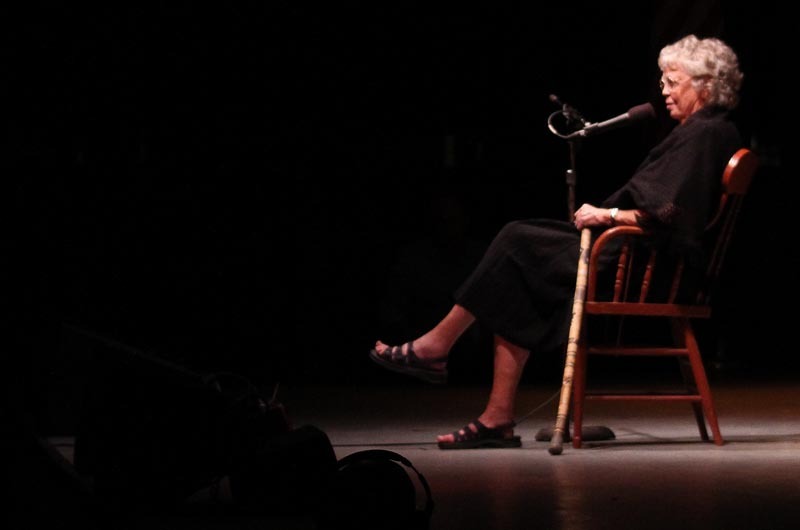 Author during a performance at the Moth in 2013. I have traveled a great deal over my long life and have made some interesting connections with people who were from or knew someone I do on the Vineyard. I have met a West Tisbury neighbor in Tanzania, a friend of my daughter’s in Peru, an Aquinnah summer resident in Indonesia, and a woman wearing a Black Dog T-shirt in Wales. But the most interesting connection I have made is with the Queen of England. She doesn’t know me, but I know a lot about her, and the connection, although one sided, has intrigued me all my life. I was born in 1926 in New York city on April 27. Elizabeth was born the week before, on April 21, in London, a niece of King Edward VIII who later abdicated; Elizabeth’s father then became king, making her heir apparent as she had no brother. As a teenager I read about her in the newspapers as German bombs fell on London and I collected tin cans and foil from the neighborhood in a little red wagon. About the same time Elizabeth and I began our disparate lives, another pair of sisters were born in Frankfurt, Germany — Margo and Anne Frank. The Frank family, being Jewish, took refuge in Amsterdam when World War II began. After two years in hiding, they were betrayed and caught. The family was separated and Margo and Anne died in a concentration camp in 1945. Yet the entire world knows their story thanks to a diary Anne kept while in hiding. I have always felt a relationship with Elizabeth, perhaps because our adult lives ran a parallel route for many years. In September 1947, at the age of 21, I married a 26-year-old Navy veteran. That year Elizabeth also married a 26-year-old British Navy man. Elizabeth had a son in November 1948; I had a son eight months later. Elizabeth delivered a daughter in August 1950; I had a daughter eight months later. When in 1953 Elizabeth’s father, the King of England, died, I worried for a year that my father would also die. But that is where the similarities in our parallel lives began to tear apart. I was relieved. My father lived until 1976. Then the similarities in our lives went off track. I had another daughter in 1955 and Elizabeth bore two more sons in 1960 and 1964. Since that time, some fifty odd years ago, Elizabeth and I have lost touch, but in April 2016 we both celebrated our ninetieth birthdays. Elizabeth’s celebration was, no doubt, more expansive — and expensive — than mine, but no happier. Some years later, our two lives have merged again. In 2018 my granddaughter Katie had a baby girl with her fiancé Sean McMahon. They named her Isla, a name I had never known before — until I found out that Elizabeth’s granddaughter and daughter of Princess Ann, had a second child named Isla. My Isla is my second great-grandchild. Elizabeth’s Isla is her second great-grandchild. Have the coincidences begun again? Hardly likely, as Elizabeth has five other great grandchildren. I only have two, but maybe the next one will be Savannah or Mia — or maybe even George. Shirley Mayhew lives in West Tisbury. Love your story Shirley! Captivating, romantic and hopeful. Congrats Grandma! Thank you, Joyce - It's daughter Deborah who is the Grandma (how did THAT happen?) I am the Great-grandma! Keep on writing, Shirley! We love your work. I always enjoy Shirley's well written reflections particularly about the olden days of up-island.